Blurb: The day Louisiana teenager Rory Deveaux arrives in London marks a memorable occasion. For Rory, it's the start of a new life at a London boarding school. But for many, this will be remembered as the day a series of brutal murders broke out across the city, gruesome crimes mimicking the horrific Jack the Ripper events of more than a century ago. Soon “Rippermania” takes hold of modern-day London, and the police are left with few leads and no witnesses. Except one. Rory spotted the man police believe to be the prime suspect. But she is the only one who saw him. Even her roommate, who was walking with her at the time, didn't notice the mysterious man. So why can only Rory see him? And more urgently, why has Rory become his next target? In this edge-of-your-seat thriller, full of suspense, humour, and romance, Rory will learn the truth about the secret ghost police of London and discover her own shocking abilities. Review: Before I review this book, I should let you know that I’m really not a big fan of scary-horror-thriller type novels though I would consider myself a bit of a Maureen Johnson-novel-worshipper. So it kind of surprised (and excited) me that I ended up enjoying this novel as much as I did. So let’s start with characters. As usual, Maureen Johnson has created an amazing main character in Rory Deveaux. She’s funny, a little bit awkward, a little odd at times, she’s a bookworm and she’s smart, and I can connect to her as a reader and of course, I wish that she was actually real. I loved Rory’s friends as well, Jazza, Boo, Jerome and the rest of them- even the one’s like Charlotte, who’s a little bit too bossy for anyone’s liking. I liked them all so much because I found them interesting but they were also real- some of them had even a little bit too much likeness to people I know...(Charlotte had a twin, right?). I even liked the Ripper, I know that sounds insane, but I loved how Maureen created the new ‘Ripper’ and the history of it and how it ties in with the actual Ripper (it’s hard to explain without completely spoiling who the Ripper is). Now on the plot. I really enjoyed how Maureen set everything out, there wasn’t ever really a moment where things didn’t seem to fit right, at least not after everything was revealed in the end. The plot as a whole was amazing- the idea of the new Ripper who is recreating the original Jack the Ripper’s crimes in modern day London is just amazing. Like I mentioned before I’m not really a fan of the scary kind of novel (I consider Jack the Ripper to be scary, personally) but I found that I wasn’t really scared of anything within the novel- there were some parts that sent a few shivers up my spine but nothing I lost any sleep over. World-time. Technically, Maureen didn’t really create a world as such for the novel but I really wanted to comment on all the local knowledge within the book, I’ve never been to London before (sadly) but I felt like I knew the streets and the places that Rory was going, just because Maureen described them so wonderfully. The only thing I was slightly disappointed about in this book was the romance. After reading a couple of Maureen’s books, I was expecting that same kind of romance- maybe not as sweet and fluffy as her usual things, but I just wanted a little more romance in this one. 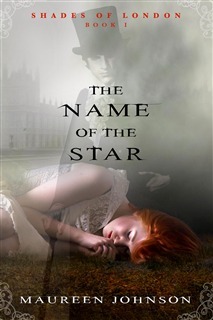 I would definitely recommend reading The Name of the Star, even if you aren’t usually a fan of this sort of thing, I’m sure that you’ll end up liking it! I can’t wait to get my hands on the second book as soon as possible!